Despite the surge in popularity and the high demand amongst developers and builders for travertine, many homeowners may not be too familiar with the stone when compared to marble or granite. Travertine is a sedimentary limestone deposited by mineral springs with formations located all around the world, notably Tivoli, Italy, where the name travertine was derived. The first mention of a travertine discovery dates back to 75 BC during the reign of Julius Caesar. The springs of Tivoli had an abundance of the stone due to the volcanic activity from Mt. Etna, making it the prime building material for the Ancient Romans. 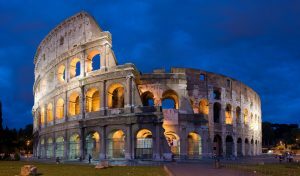 The most well known Roman marvel, the Colosseum, was constructed using travertine and still remains structurally intact due to the durability of travertine – one of its main characteristics. Michelangelo also chose travertine as the outside border of the dome in St. Peters Basilica. Travertine is mined from quarries all over the world, including some of the largest quarries in Turkey, Italy and Mexico.Although there are natural formations of travertine scattered within the United States, there aren’t any travertine quarries that mine travertine in the United States. In the 1980s, travertine was only mined in Italy, but now Turkey, Iran, Peru, and Mexico are frequent exporters. Travertine is often confused with marble, granite, onyx, limestone, and slate, but the main difference is the formation process of the stone. Travertine is formed when carbonate materials rapidly precipitate, caused by rain, sleet, and snow undergoes extreme heating or cooling caused by weather fluctuations usually at the mouth of a hot spring or limestone cave. Both marble and limestone are categorized as metamorphic rock and are formed under extreme heat and pressure. Travertine is easily distinguishable from other stones due to the deposits that form in the rock when precipitation from the heat and air erodes the stone underground, which is why it’s frequently found in springs, lakes, and valleys. Travertine is also an environmentally friendly alternative to other building material because it doesn’t go through a rigorous manufacturing process. 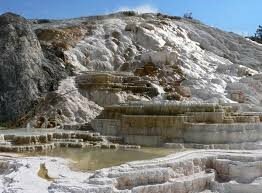 Travertine is also distinct from other stones due to the fibrous pores in the stone. The holes in the stone can be filled for a smooth finish or left untouched, giving a rugged and natural look. 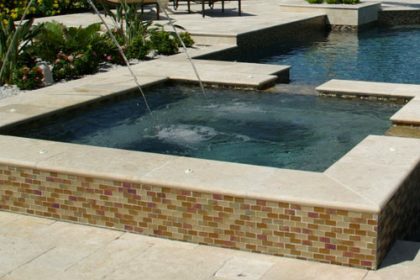 The pores in the travertine are not only aesthetically appealing but they also quickly absorb water, making travertine a perfect choice for an outdoor area for a pool. How is Travertine Used Today? You can find travertine structures all across the United States, such as the Getty Museum in Los Angeles, California to the natural formations that line the Grand Canyon. Travertine is also becoming a popular choice for home designers, so you may have seen it in homes or office buildings. 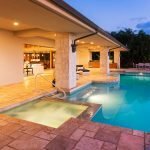 Travertine is becoming the preferred building material for the design of the facades of buildings and walls, the linings of pools, outdoor decks, and tiling in showers and tubs. It doesn’t require extensive maintenance or upkeep and can withstand extreme temperatures, making it durable in any weather condition. 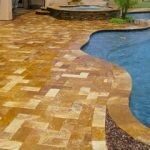 It is also a cost-effective solution to other stones – unlike the alternatives, if one of your tiles or the travertine material gets damaged, it’s easy and simple to replace. Travertine comes in several finishes such as polished, tumbled, brushed, and honed, depending on your preference. Polished and honed travertine is glossy and is smooth to the touch. 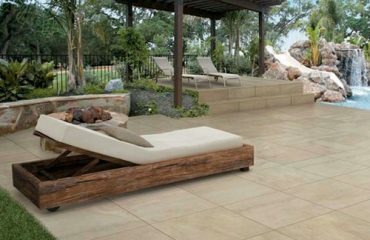 A tumbled finish gives travertine a textured look and has a non-slip surface. 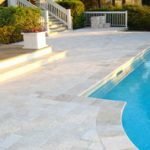 Smooth finishes are ideal for indoor surfaces and liners and tumbled travertine pavers are primarily used for outdoor columns, decks, and pool areas. Due to the fluctuations in weather and carbonate materials, travertine comes in an array of natural colors that range in hues and design. Smoothing travertine makes it a great choice for indoor shower and tub liners. 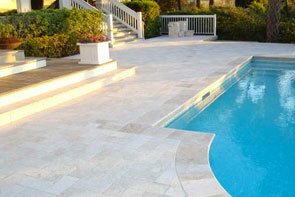 Travertine comes in several different patterns and its versatile nature also makes it a great choice for pavers, mosaics, tiles, and moldings depending on your project. Every piece of travertine is different, which is what adds a unique touch to your space. Travertine ranges in size and thickness, consult Texas Travertine for help with your project. Unlike other distributors, at Texas Travertine we work directly with the quarries to get travertine delivered to you. 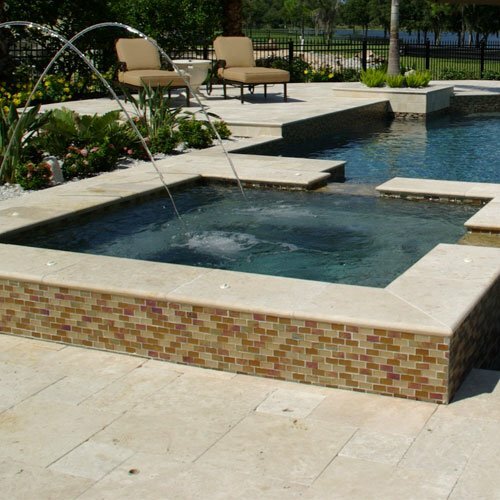 We supply the highest-grade travertine and guarantee that everything you buy will be of premium quality.